Surgeries may be required for a variety of reasons and at all stages of a pet’s life, from spaying your new puppy to a major orthopedicThe branch of surgery concerned with conditions involving the musculoskeletal system. repair. Some surgeries can be planned in advance, and some are required in an emergency situation, but both can be stressful for pets and their owners. The more informed you are about the procedure your pet will be having, the better you will feel. When you are more comfortable, you can be the steady support they will need. Scheduling the procedure: Be sure to choose a day when you will have time to drop off and pick up your pet without being rushed. Animals can pick up on your anxiety, and you can add to your own stress by not allowing time for your questions to be answered. Withhold food and water: Almost all surgeries will require your pet to go without food or water before the procedure. Check with your veterinarian about their recommendation based on your their health and the procedure that will take place. It’s hard to deny those hungry puppy eyes, but be strong! Your pet’s life can depend on it. Food and water are withheld to prevent aspiration (the inhaling of food or water into the lungs). Your veterinarian will give you specific advice for your pet depending on its age, size and particular medical condition. Pre-surgical medications: Many procedures require medications beforehand. Understand what medications your pet has been prescribed and when and how to administer them. Your veterinarian or hospital staff members can answer questions and give demonstrations on how best to administer them. Some questions to discuss include giving medicine with food or without, the appropriate time of day for the medicine, when the first dose should be given, and if your pet is staying more than a day, should you bring their medication the day of surgery? 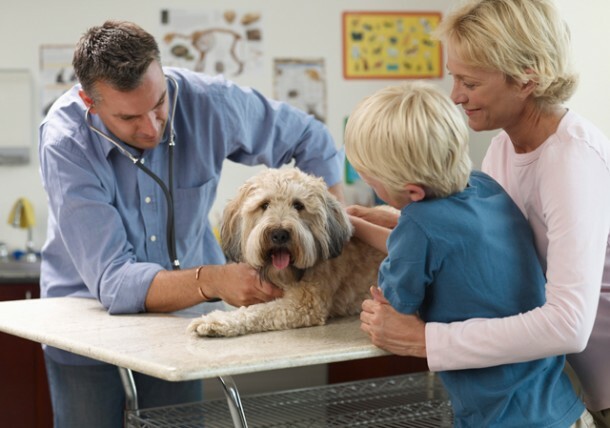 Know the staff: The veterinarian will not be the only person interacting with your pet. There will be staff members attending them before, during and after surgery. Get to know the staff at your veterinary hospital; they will be a valuable resource for you. Physical comfort: Rest is the best medicine right after surgery. Your pet will need a place to rest safely and quietly when you pick him up. Depending on the nature of the surgery, you may need to keep them from the temptation to jump on the couch or bed or to play in the dirt. Any bedding should be cleaned to prevent infection. Feed lightly: Many anestheticA substance that induces insensitivity to pain. medications can cause some nausea. Also, withholding food before surgery can make your pet’s stomach a little sensitive. The first meal after surgery should be small, just a couple of mouthfuls. If there is no vomiting, offer half a regular meal a couple of hours later. If their stomach is still okay, you can resume normal feeding. Be careful with water intake as well. After not drinking for a while, pets tend to gulp water down, which can trigger nausea as well. Offer small amounts of water every 15 minutes or so until their initial thirst is quenched, and then allow free access. Post-surgical medications: Any medications prescribed after surgery are vital to your pet’s recovery, from infection prevention to pain management. Set an alarm to make sure you administer medications on time and finish the prescription; don’t “save” medications for later. Contact information: Make sure you have accurate contact information to avoid scrambling in the event that you need information or emergency care. Is there a hospital to call after hours? Who will you need to contact if you have questions or concerns overnight? Coughing: While coughing is a fairly common occurrence (often caused by irritation from the tube placed in your pet’s throat to administer the anesthesiaInsensitivity to pain, especially as artificially induced by the administration of gases or the injection of drugs before surgical operations. and protect its airway), it can also be a sign of infection. If you are concerned, call your veterinarian. Bleeding: Some incisions will seep a little blood; this is common. You may notice a little crusted blood around the incisionA surgical cut made in skin or flesh. the first day or so. You can very gently blot with a paper towel moistened with hydrogen peroxide, and then carefully blot dry with a second paper towel if you want to, but there is usually no need to clean incisions. Any actual bleeding (not seeping) that occurs should be reported to your veterinarian as soon as possible. Infection: Inflammation is normal; infection is not. Inflammation (i.e., tiny bit of redness, very minor swelling, warm to the touch) signifies healing. Infection (i.e., angry redness, major swelling, hot to the touch, any fluid, pus or discharge) is a complication that needs to be examined. Call your veterinarian if you notice any of those signs. Hopefully this information will help de-stress surgery days for you and your pet. Be thorough and honest when discussing their health. The more information your veterinarian has, the more a surgical procedure can be tailored to your pet, ensuring a smooth and effective procedure. Working together, you, your veterinarian and your veterinary hospital staff can keep your best friend in the best of health!